Some people think Halloween isn’t as fun with kids because you can’t spend all night partying. 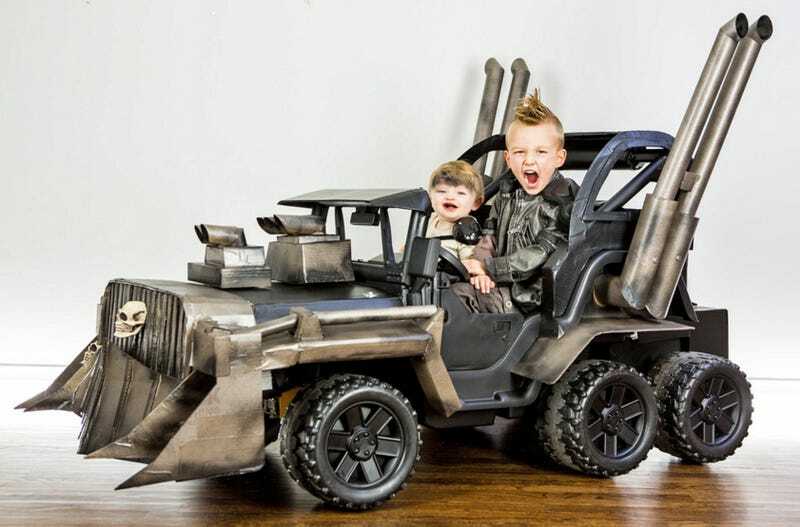 But Cory and Jeremy Newton-Smith once again prove that Halloween is infinitely better when you’re a parent, because you get to build phenomenal costumes like this Mad Max Power Wheels. What started off as a couple of second-hand Power Wheels toys (including one of Barbie’s rides) was turned into an amazing Mad Max prop powered by four electric motors. The pint-sized perfect replica also boasts power steering, seating for two, a keyed ignition, sound effects including a truck’s air horn, and an iPhone override so it can be steered remotely from a smartphone when a night of exhaustive trick or treating finally takes it toll. If you remember back to previous Halloween creations from Cory and Jeremy—like the BTTF DeLorean stroller or the tiny Ecto-1—their son Cooper is usually the adorable star of the show. And this year he looks quite convincing as a very, very young Mad Max. However, this year it’s his younger 11 month old sister Ziggy who completely steals the show as the cutest take on Imperator Furiosa you’ve ever seen. Just give her all the candy already.